Q: Austrian Airlines said last year it plans to generate a positive operating result in 2011. First-quarter traffic results, however, showed that the crisis in the Middle East and the natural disasters in Japan affected negatively long-haul flights. What are the repercussions of that trend for Southeast Europe (SEE)? Is the company on track to achieve profit? A: The crisis in the Middle East and the tsunami in Japan had a considerable effect on Austrian Airlines, since these regions account for 20% of our flight programme. The demand for air travel to these countries and regions fell sharply, making our goal of a positive operating result in 2011 even harder to reach. But we are still reaching for this goal and we are working hard on achieving it. Speaking about our performance in Europe, we are pleased with having transported almost 5.0 million passengers from January to July, which is a plus of 3.6% compared to last year. Also in our whole network, we are growing in terms of passenger numbers: We carried more than 6.2 million passengers from January to July, which is a plus of 2.0%. 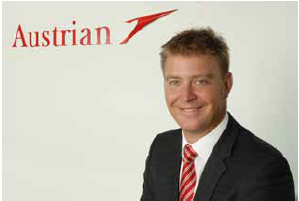 Q: How did the consolidation with Lufthansa affect Austrian Airlines’ positions in the region? What is your business strategy for SEE in 2012? A: In the past, Austrian Airlines was a pioneer in opening up flight connections between the SEE states and Western Europe, and we still are. We have a traditionally strong expertise in the SEE markets, which is why we also took over the lead for the Lufthansa Group in several of the SEE countries. We will continue to establish new and expand our existing powerful connections to Western Europe, America and Asia. And we will continue with our growth strategy in SEE in the future. Already today customers have the choice to fly via the hubs Vienna, Munich, Frankfurt, Dusseldorf or Zurich. We offer the strongest product for our customers in the region. The combinability of tickets gives our customers more flexibility in travel and also helps them save time on their journey. Q: Which are Austrian Airlines’ top markets in the region and where do you see the biggest growth potential? A: It is almost impossible to compare single countries or markets, since every market has its own specifics and parametres. What we are working on is to provide powerful connections from the SEE region to the world, which in the end will encourage further economic growth. We see high potential for investments in the whole region. With our flights, we offer a strong product for business and leisure travellers. Q: How would you describe the general business environment in the region? A: We definitely see a positive business environment in the region. There is room for economic growth and for direct investments in the region. Q: Apart from the recent introduction of 21 Airbus A320 aircraft to your fleet, do you plan any other major investments whose effect would be felt in the region? A: For our customers from the SEE region, next year will bring a big improvement in terms of passenger comfort: at our hub Vienna, we will move into the new terminal called Skylink. It features new lounges, a modern atmosphere and easy connections. So if a passenger from the SEE region travels on a connecting flight with Austrian, this flight will be smoother and more comfortable than ever. Q: Passenger traffic at the airports of Sofia, Varna and Burgas rose in the first half of the year. Did Austrian Airlines too see passenger numbers go up? A: Yes, we are pleased with the development we have in the passenger numbers, especially in the SEE region. We grew by 3.6% in our European network – the SEE region doubtlessly contributed a big share to this satisfying development.